No Green councillors were elected despite the party coming second in 17 out of 21 wards and in the mayoral election. 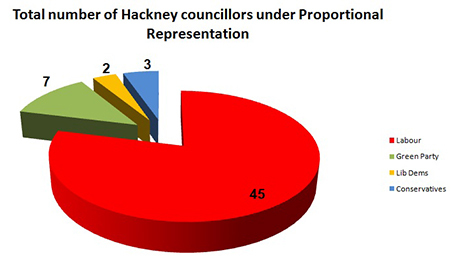 The Hackney Citizen estimates that if the proportional representation system used in the European elections was employed in local elections, the Greens would now have seven councillors in Hackney, making them by far the largest opposition party locally. Our estimate relies on the average (mean) number of votes won by each party by ward (see below for further explanation of our calculations). First past the post, which is used in local elections and general elections, allocates seats to candidates who receive the most votes. Proportional representation, by contrast, endeavours to reward parties who have not come first but still received a significant share of the vote by giving them a minority share of seats. Under proportional representation the Greens are highly likely to have taken one of Labour’s seats in each of Clissold, Dalston, Hackney Central, Hackney Downs, Lea Bridge, London Fields and Stoke Newington wards. 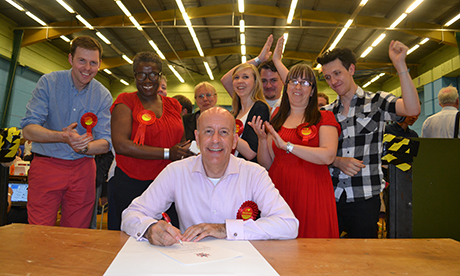 The Liberal Democrats would have lost one of three seats to Labour in Cazenove. The same fate would have befallen the Conservatives in Springfield ward. These predictions amount to approximations since there no way of calculating with absolute certainty the result under proportional representation because of the differences between this system and first past the post. However, we think the method we have used is viable since in most wards candidates from the same political party received similar numbers of votes. As things stood the Liberal Democrats held onto their three seats in Cazenove ward, and the Conservatives remain the main opposition with four seats. In Lea Bridge and Stamford Hill West wards the Conservatives’ Linda Kelly – the party’s mayoral candidate – and Bernard Aussenberg lost their respective seats. Our analysis was based around the so-called D’Hondt system of proportional representation. To do the calculation we needed to know the number of votes received by each party. However, in the local elections voters elected specific candidates rather than voting for particular parties per se. To get around this problem, for each ward we took the mean average of all candidates by party. From this we were able to apply the D’Hondt method. The following are the results from Cazenove ward, followed by an illustration of the process we used to calculate numbers of seats under proportional representation. The Liberal Democrats have the most votes. Therefore they win the first seat. Labour have the most votes. Therefore they win the second seat. We divide Labour’s number of votes by two since they won one seat. The Liberal Democrats have the most votes. Therefore they win the third seat. Since Cazenove ward has three available seats, those are the final results, i.e. The Liberal Democrats win two seats and Labour wins one seat. 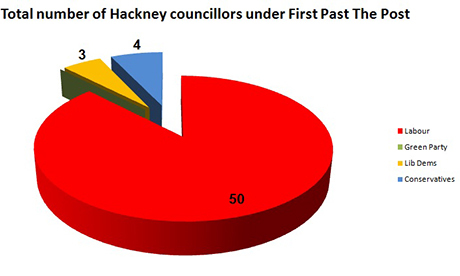 We repeated this process for every ward in Hackney.